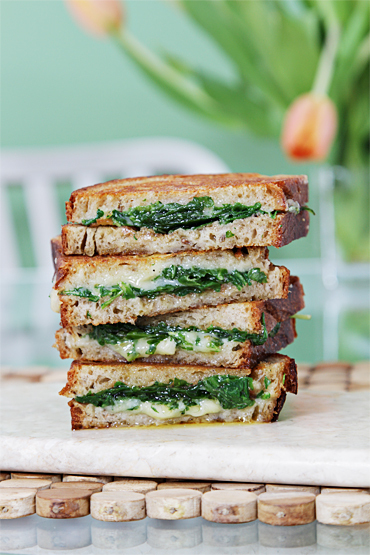 This gourmet sandwich is among the most popular recipes on our website. And for good reason: It goes way beyond the traditional grilled cheese sandwich, which relies on plain white bread, butter or margarine, and orange American cheese. Viviane, by contrast, uses crusty rye country bread, peppery baby arugula, the garlic spread, and a “nutty, pungent” aged cheddar, gruyère or fontina. While you can use other types of oil, Viviane prefers extra virgin olive oil. “Since the temperature of the oil doesn’t get too high, its natural flavor is preserved and then slowly imbued with the delicate garlic flavor as the cloves cook,” she says. We’d use our Everyday or Arbosana oils. Viviane recommends using the leftover oil in salad dressings and marinades. It’s also good, she says, for drizzling on vegetables or dipping bread.